There is nothing better than ending a cool winter day than with a bowl of something cooked in a crock pot. 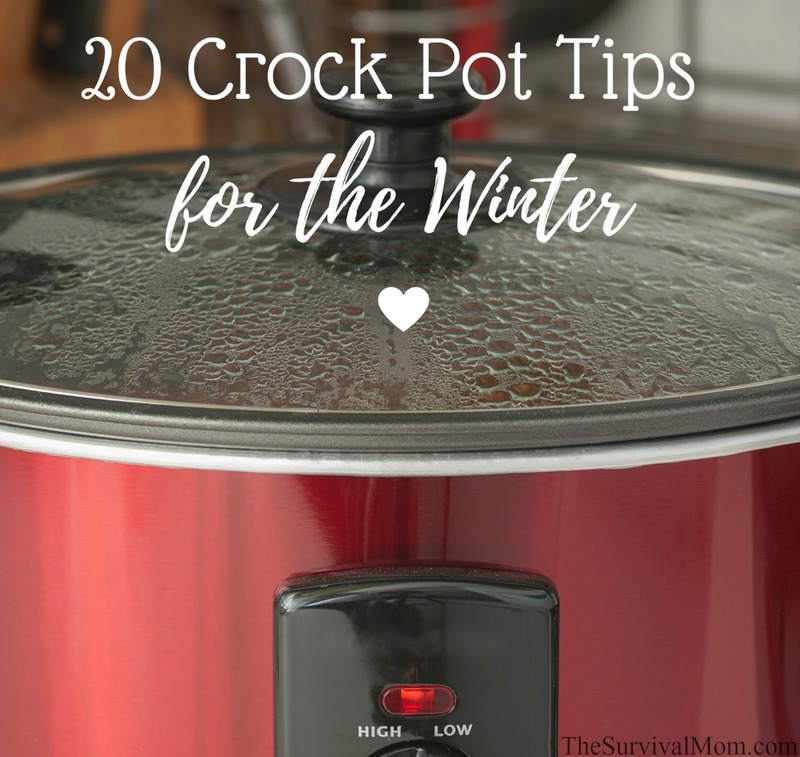 In our home, we adore our crock pots, all four of them. There is always one on the counter top ready to go. The soups and stews are always a big hit, and a really good crock pot recipe book is worth its weight in gold. Lately, we have been branching out and using our crock pot for more than soup. We’ve learned some tricks and tips than can take your crock pot meals to the next level. Slow cookers come in a variety of sizes, usually 1 quart to 8 1/2 quarts. Follow the recipe’s recommended size. This is important becasue the correct quart cooker will allow your meal to cook properly, and you won’t have an overflow of mess to clean. Most recipes will work best in a 5 to 6 quart slow cooker. Every time you open the lid, heat escapes and you lengthen the cooking time by 15 – 20 minutes. The best time to check on your dish is about 45 minutes before it should be done. You will be able to tell how much of your cooking time needs to be adjusted. Do not put too much in your crock pot. Most manufactures recommend that you fill your slow cooker no more than two-thirds full. Check what the manufacture recommends for your specific brand and size pot. By following the recommendations, you will avoid any possible food safety hazards and your meal will be finished on time. Don’t be afraid to cook whole chickens and big meaty roasts. These can be very healthy meals. Just check that the lid has a good snug fit. Bacteria love to become an uninvited guest at temperatures between 40° and 140°F degrees. The best way to avoid the danger zone is to put your prepped food in separate containers in the refrigerator ahead of time. Do not cook large chunks of frozen meat in the crock pot. There is no guarantee that large pieces of meat will be cooked all the way through. If you need to double check your food’s temperature, a good quality digital thermometer like this one will give you the information you need without having to lift the crock pot’s lid. Works great when keeping track of food in the oven, too. To maximize the flavor of your meal, brown your meat in a skillet before adding it to the crock pot. Then deglaze the pan and with wine or broth. Deglazing gets all of the caramelized pieces of meat from the bottom of the pan. Add the liquid with those yummy bits of meat to your crock pot and you will have a richer flavor in your meal. Out with the old crock pot! Check out the new crock pots! There are so many new options available now. If you need your crock pot to do its cooking while you are out of the house, look into the programmable models. On these models, when the food is finished cooking, the slow cooker adjusts its temperature. This keeps your food warm, but at a safe temperature until you are ready to dig in. The latest crock pot in my house has a rubber lined hole in the top of the lid for a meat thermometer. This is a pretty brilliant combination of the crock pot with an indispendable thermometer.The thermometer fits snugly into the lid so none of the heat escapes out. Perfect for larger cuts of meat. It is basically a little oven. So give it about 20 minutes to warm up all the way before you start adding your food. Just like you pre-heat your oven, pre-heat while prepping your food. It also cuts down on cooking time. Putting frozen food in the slow cooker can increase your chances of bacteria growth. Remember that danger zone of 40 to 140 degrees F that was mentioned above? Prevent bacteria by avoiding all frozen foods. Fully thaw out all meats and vegetables before adding to the cooker. We have thawed out meat in the fridge or used our microwave to thaw vegetables. The only exception to this rule would be the prepackaged crock pot meals that are sold in the frozen food section in the grocery store. Just follow the directions on the back of the package. Gingerbread in a crockpot meal? Toss in some crumbled gingerbread or crushed ginger snap cookies! Ginger adds a depth of flavor and texture to the liquid. Use them in beef type dishes like stew and pot roast. Look for wines that are dry and have a high alcohol content to add more complex flavor to your dish. The alcohol doesn’t evaporate out much because the cooker lid is sealed. So remember that a little bit goes a long way. Like the wine, use a vanilla of high quality. The alcohol in the vanilla doesn’t burn off as fast and leaves a more intense flavor. Use the same amount your recipe recommends. If you rush out the door in the morning with food in an unplugged crock pot, you must toss it. I know, it hurts. But forgetting to plug or turn the crock pot to low or high means that your food could have spent the day in that danger zone. Even having uncooked food on the warm setting needs to go too. The warm setting isn’t warm enough to prevent bacteria. It is hard to throw away food, but it is easier than being sick. Again, you need a good food/meat thermometer! To get all of your ingredients cooked at the right temperature and finished at the same time, you must layer. Any root vegetables, like potatoes and carrots, need to be placed at the bottom of the pot. These foods take longer to cook and need to be where most of the heat is. Place the meat on top of the root vegetables. If you are going to cut the meat, cut it into uniform pieces for even cooking. Any other smaller or delicate foods, such as mushrooms, can be placed last. They require a shorter cooking time. Using freeze dried foods in the crockpot is a cinch because there’s no washing,slicing, or chopping. They will also cook much more quickly. You might try adding freeze dried corn, like this sweet corn from Augason Farms or freeze dried peas. You’ll notice that once rehydrated, it’s hard to tell their appearance from fresh or frozen. Just add a little more water to the crock pot to allow full rehydration of these foods. These can both be tricky. When overcooked, they become an inedible blob in your dish. It is best to add rice the last 30 minutes of cooking. Cooking the pasta separately and adding it to your food right before serving is a safer bet. My friend makes this pasta dish and swears by its ease and taste. I feel the ziti is a heavier pasta and that is why it works in this recipe without being cooked on the stove top. Use cooking spray to spray the inside of the crock pot, and rinse the noodles in a colandar and set them aside. In a small bowl, combine the ricotta, egg whites, 1/2 cup Parmesan cheese, 1/2 cup mozzarella, salt, and pepper. Stir until this is a smooth mixture. In the crockpot, layer half of the noodles, about 2 1/2 cups. Pour 2 cups of the marinara sauce over the noodles. Use a spoon to smooth the sauce over the noodles so they are all covered and create an even layer. Drop small spoonfuls of the ricotta mix over the sauce/pasta. Use the back of a spoon or a spatula to carefully spread the cheese mixture over the noodles. Repeat the 3 layers: noodles, marinara, and cheese. Over the top of everything, pour the remaining marinara sauce. Cook on low heat for 4-6 hours. By this time, the ziti will be finished. Sprinkle the remaining cheeses over the top, cover with the crock pot lid, and allow about 10 minutes for the cheese to melt. Garnish with the fresh basil and serve. Notes: For a heartier dish, you can add a layer of cooked ground beef, sausage or vegetables, such as mushroom and spinach after the sauce layer and before the cheese layer. This recipe freezes well. Source of original recipe is here. Some foods are better the second day. Many soups increase in flavor when they have had time to sit. About 24 hours should do it. If your dish has any sinewy tissue, like brisket, it will also have an improved flavor after sitting in the refrigerator for a day. For low heat, chose pork shoulders, chuck roasts, short ribs, chicken thighs and drumsticks and any other tough or fatty meat. They tend to become tender and moist. Avoid cooking chicken breasts, pork loin and other leaner cuts of meat on low. They often get dried out. Trim any excess fat before cooking. You don’t want greasy liquid floating on top of your dish. Milk products, like yogurt, milk and sour cream should be stirred in the last 15 minutes of cooking. If you add them earlier, they tend to break down and you will not have the creamy consistency you are looking for. If you end up with mushy veggies, scoop them out and puree them. Reduce the puree in a sauce pan and make a glaze to pour over the meat or add it to your sauce. To prevent mushy tomatoes, try sun dried tomatoes or use whole canned tomatoes and cut them into large pieces. Diced or crushed tomatoes can disintegrate into your dish. The sealed lid allows moisture to stay in the most delicious cakes, breads and brownies. Even cheesecake! Consider using your slow cooker to make party mixes and to roast nuts. Breakfast in a crock pot is an easy way to start the morning. Steel cut oatmeal or a breakfast casserole can be easily prepared the night before. A crock pot also does a great job with oat groats. If you are short on fresh fruit, experiment with dehydrated or freeze dried fruit in your recipe. Combine freeze dried raspberries with either fresh or freeze dried apple slices to give an apple cobbler a bit more flavor. Keep in mind that when you use either dehydrated or freeze dried fruit in the crock pot, you’ll need to add a little more water for rehydration. Any sudden change in temperature can cause the ceramic insert to crack. Place a dish cloth in between the insert and cool countertop if needed. Let the insert come to room temperature before you expose it to a hot or cold element. There are plastic liners available that are specifically designed to be used for crock pots. The make clean up easy! Sounds like a lot of GREAT information. My wife and I use to do some crock cooking but got tired of getting the “bellie ache”. After reading this article I’m starting to understand why. Thanks for providing the info. We’ve already purchased a new crock pot. And, thanks for providing such informative information. GOD BLESS YOU! You suggested having a good crockpot cookbook. Any suggestions? Thanks. 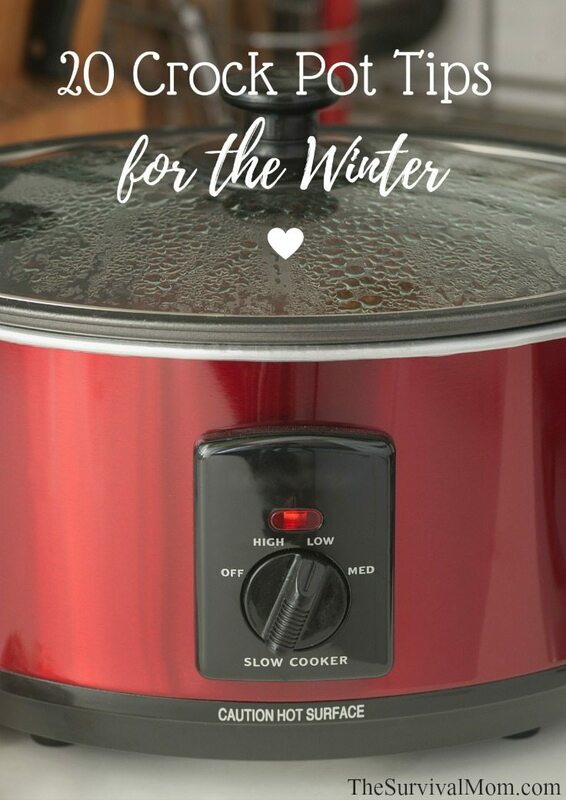 I have a slow cooker by Hamilton Beach that has a 2qt, 4qt and 6 qt crock that fit on a standard base so it is easy to choose the size that is best for the recipe. Also, beans are a breeze to cook in any slow cooker. If you use enough water they will not boil dry or bubble over. Since I am vegan I make a bean meal almost every day in my slow cooker. Potatoes are great in a crockpot. 1 large sweet potato or 1 layer of regular potato – 1/2 cup water. If 1/2 – 3/4 full use (again) 1/2 c water. If full 3/4 c water. Don’t poke with fork. Cook on high for 2 to 2 1/2 hours for small; 2 1/2 to 3 hrs med or 3 to 3 1/2 hours full. I found this super simple + really good. She said low makes the potatoes darker so I use high. And for the vegan – it is from Fast cooking in a Slow Cooker Every Day of the Year by Joann Rachor. And for everyone else, she is like a hyper researcher with detailed reports of how to test your cooker for speed and charts for small, medium, large and the 1 1/2 quart cookers as well as lots of good recipes. If you want extra try this one. If you want basics there are a lot of slow cooker books out there. I started using the crock pot liners when I broke my arm. I had a cast that went from just beyond the tip of my fingers up to my armpit. I bought a large bowl and all I had to was gather up the bag and move it to the bowl, then to refrigerator. I couldn’t use my oven, so these were a life saver. They saved me from microwave meals.